President Bruce opened the meeting by giving a warm welcome to our friends and guests Sue and Ray Bishop from Rumah Sehat; lovely Australian visitors Mark Sullivan and Leesa Murry and Rosie Edwards; and two new guests – Julie Gavage and Lodovico Minelli…international visitors from Belgium and Italy. Thanks for coming and hope to see more of you in the future! Passed: changed the Continuing Resolution to reflect the new Rotary rule that a minimum of two meetings are to held every month. So beginning Oct. 1st, 2016, the club will meet on the 2nd and last Monday of each month. More meetings can be held if needed. Treasurer Allan. Will to contact several previous guests concerning sponsorship of Rotaract to APRRC (Asia Pacific Regional Rotaract Conference) in Thailand NEXT Aug. Allan has contacted potential sponsors already with good results. Guest speaker Margaret suggested to ask for a sample to be made before you give the full deposit and commitment. Dr. Steve Wignall has rewritten and combined his 3 HIV project proposals into one that we will try and submit as a Global Grant which start at US$ 15,000 and go to US$200,000. One of the key things is to be able to get the underwriting funds to get before attracting the global grant. We would be the host club and the other clubs would be supporting partner. Bruce and Terri are to meet Thursday with Marilyn Carson of the old club to get some help putting our first Global Grant together. Membership – We want each member to focus on finding one potential new member each month and have them come to a meeting. Coming up: Speakers have been scheduled through the end of the year at our end of month meetings. December 4 has been chosen for our Third Annual Rotary Fundraising Christmas Buffet at the Maya Resort and Spa – we have a lot work to do to make this event a success and are beginning right now. Start speaking to friends and neighbors about attending this great Christmas event. Terri and Bruce will attend the Grant Management Seminar in September in Bali. Bruce has been in contact with Marilyn, Rich & Danielle Foss, and Judith and Bill Schneider about obtaining support our sponsor man Kaler during his last year before he receives his Ph.D. NO update. We need ALL members to obtain a Facebook account, even if you personally never really use it. Once you have one, search for Bali Ubud Sunset Rotary Club and then JOIN that page. Now you’ll receive a notice in your email every time our Facebook page gets updated. Now simply Share the Post on your page and ask your friends to Share it on their page. This will spread the word about what our club is doing. This will really help and it’s so simple! Margaret Barry – She gave an inspiring talk to us. She spent 26 years in the fashion industry in India. At the first Bali bombing she noticed how expats, locals, and tourists worked so well together. She started to think about how this powerful energy could be tapped into and do something for good. In 2002 she became very interested in the mountain communities with huge the disadvantage of lack of water, education, and access to health. Over the next 14 years her organization, the Bali Children Foundation, (http://www.balichildrenfoundation.org/) covered 40 communities in Bali and helped over 2000 children using the same combination of Balinese, expats and tourists. She became involved in communities by getting into the communities via existing networks in the district. Kapala desa etc – use the existing structure. Her organization provides English and computer classes, scholarships without fear or favour. She discovered that Bali was 5th from the bottom in Indonesia out of 55 provinces for adult literacy. PISA scores which assess the competencies of 15-year-olds in reading, mathematics and science (with a focus on mathematics) in 65 countries and economies in Bali are the worst in South East Asia even though Bali is one of the wealthiest. So there is a HUGE need for education improvement here. There are needs in Lombok and Sumba but more important, she says, is to work in our own island first. How she does it. Her organization chooses an area that might benefit from their work. They meet with the Kapala Desa and the banja heads – they all figure out the most cooperative way to help. They give us list of most disadvantaged people in that village and those are surveyed. Even the village is surveyed: how many people; income; children; and an economic profile. This is stored on data base – extremely transparent. Lord Mayors charitable foundation in Melbourne will accept tax deductible donations for all who want to help from Australia and a similar tax deduction system is available in the US. We use very well qualified teachers and train them further, she said. They found it was best to NOT pay all the scholarships but to have the parents pay half. But the foundation does pay for the student’s clothes, back packs, etc. They discovered that when a student appeared poor to the teacher, they were often ignored. This is why they included clothes and back packs in ther package. By doing this the education of the student soared! Most of the parents are illiterate so they needed to develop a way for the parents to still take part in the education of their children. They did this starting art classes and the parents became the art teachers and then they even started English classes for them…parents felt comfortable and equal. Every village has a monitor…a parent or someone who is basically illiterate but who monitors attendance, all they really need to be able to do is count and write numbers to start. Marg had her a captive audience. The way they analysed and learned from the situations was amazing. She received a standing ovation at the end. One of our guests, Leesa, spoke out about marketing ourselves through social media. As a result Bruce has signed up our club with an Instagram account and added many photos, and a twitter account. 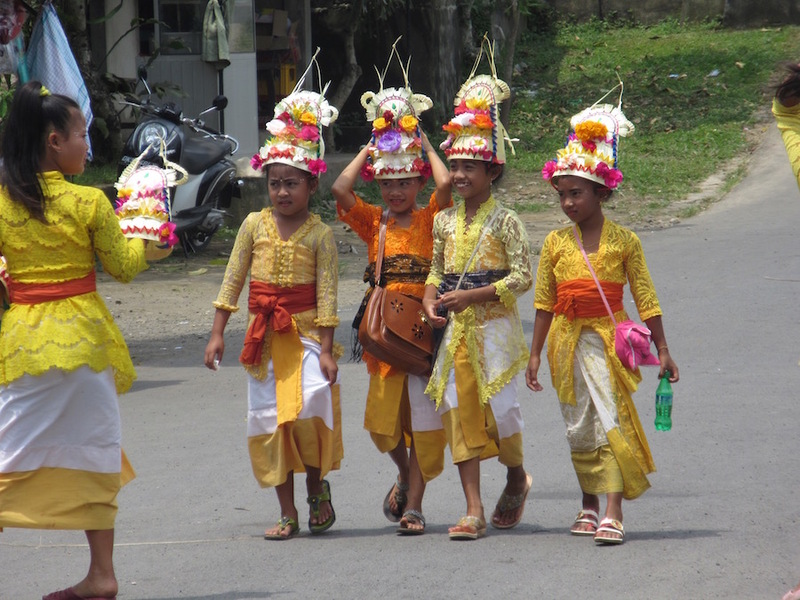 We hope this helps spread the word of our clubs great works with the local Balinese schools, children, and villages. Get young people involved…one rotary person can sponsor a rotaractor to be a member for a year – suggestion from Ray Bishop. We will look into this as we feel it is a very good idea. Next meeting: Kakiang – 22nd August 5:30 for 6:00 start.